After achieving great success in their home in Japan, Circo de Sastre (meaning "Circus by Tailor" in Spanish) is visiting Indonesia this December. 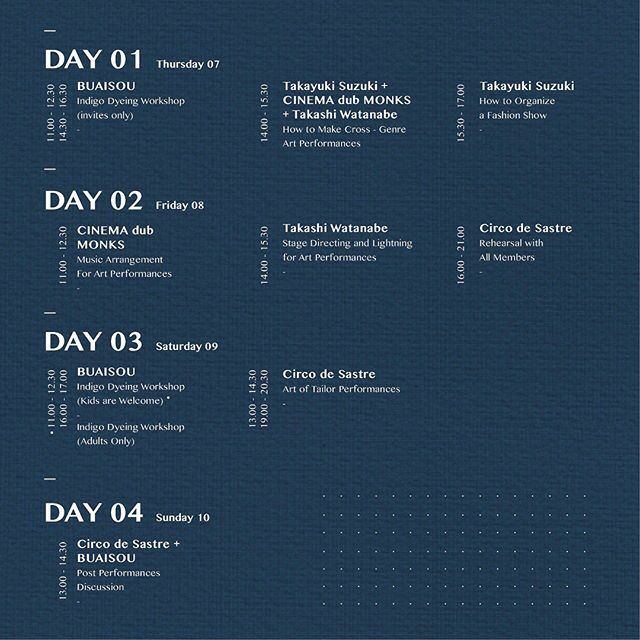 Consisting of Takayuki Suzuki (fashion designer and tailor), Cinema dub Monks, Takashi Watanabe (lighting artist), Circo de Sastre is a live music concert, new circus show, tailoring lesson and performance assembled into one. With each performance, Circo de Sastre is telling a story woven with sound, fabric and light. On Saturday, December 9, Circo de Sastre is bringing their one-of-a-kind performance to Jakarta as a part of a four-day event that is hosted by Indoestri. The group will be performing twice, at 1 PM and 7 PM, respectively. Make your reservation by emailing info@indoestri.com or sending a DM to @indoestri. The workshops and performance are free of charge.